I checked out the new collection 'Semi Precious' by Mac this morning as it launched in UK stores today. SMOKED RUBY (Mineralised Eye Shadow - Melange of burgundy and black) This eyeshadow has a blackened deep brown base with veining of a darkened red which when swirled altogether creates a rich brown shade that's shot through with red and black. It's smooth, buttery and incredibly pigmented even when used dry and without a base. I applied this in the store to my entire eyelid with my fingers and it looked beautiful, perfect for creating a quick and interesting sultry eye. I own nothing like this as it's not the sort of shade I typically go for, but once I had swatched and applied it, it just had to be mine! GOLDEN GAZE (Mineralised Eye Shadow - Melange of gold and black) This is a beautiful golden bronze shade that has a black base. When swirled and applied it has a vivid golden sheen that's shot through with black. It's smooth in texture, buttery and incredibly pigmented even when used dry and without a base. This eye shadow was the standout of the collection for me personally, it's simply divine and will be great for summer with plenty of gold and bronze jewellery! SEMI PRECIOUS ROSE QUARTZ (Mineralised Skin Finish - Rosy pink base with inner circle of silver, lime, white-pink, and copper) The outer side of this msf is a peachy pink which applies with a slight sheen, the centre part is a cool pink toned beige and has some glitter and I love the colour when it's swirled together. 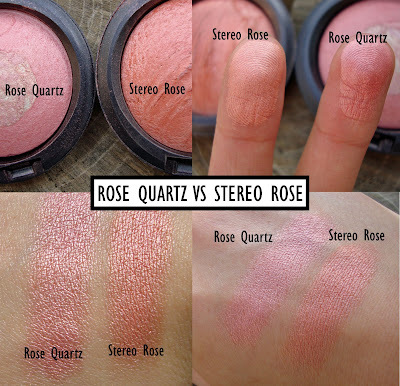 It can be used as a blush or highlighter depending on your skin tone. It's pigmented and what you see is what you get, however I wish the centre part was a little smoother in texture, but nevertheless it's still a fab product. 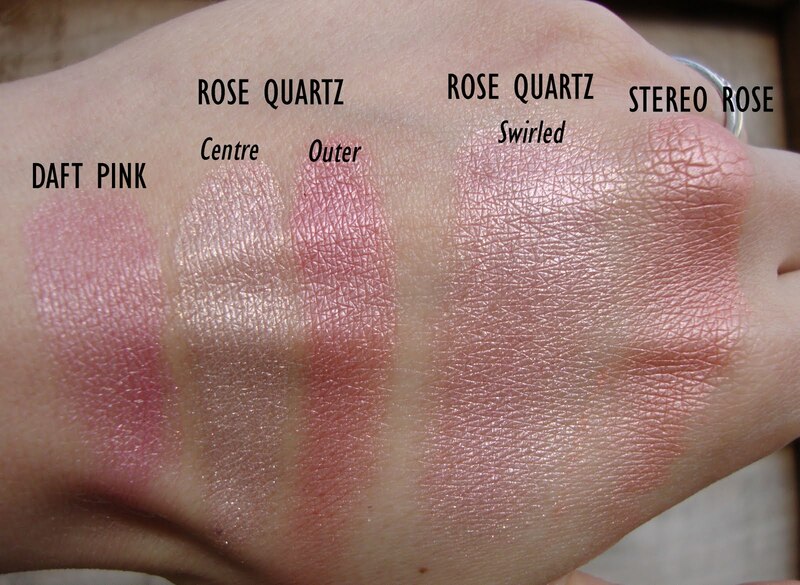 Here are some closer swatches, I have compared 'Rose Quartz' to 'Stereo Rose' msf and 'Daft Pink' mineralised blush. The OUTER portion of 'Rose Quartz' is reminiscent of 'Stereo Rose' but a pinker version. The swatches speak for themselves so I'll stop typing! I also grabbed a mini fix+ for my handbag, how cute! EYE SHADOWS - There were 12 and not all of them were pigmented and smooth, they looked pretty in the pot but were mainly disappointing when swatched. In my opinion the two I grabbed were the best of the bunch! MSF's - The design of these are a little weird but I don't mind them. The lighter 2 looked almost identical and too much like a highlighter, the darker one which was bronze was pretty but too glittery to use as a bronzer. 'Rose Quartz' was the most pigmented of the bunch but I would have loved if the texture was a tiny bit smoother but it's still beautiful. BRUSHES - What the hell were they thinking!?! LIPTICKS / GLOSSES - Some were pretty but dupable and nothing special. FYI: Fashion Flower launched today too, but I totally skipped that, it's pretty but boring. What are your thoughts on 'Semi Precious'? somehow managed to completely sleep through this collection, but that MSF has to be mine. so so so lovely! xo. i love your swatches. 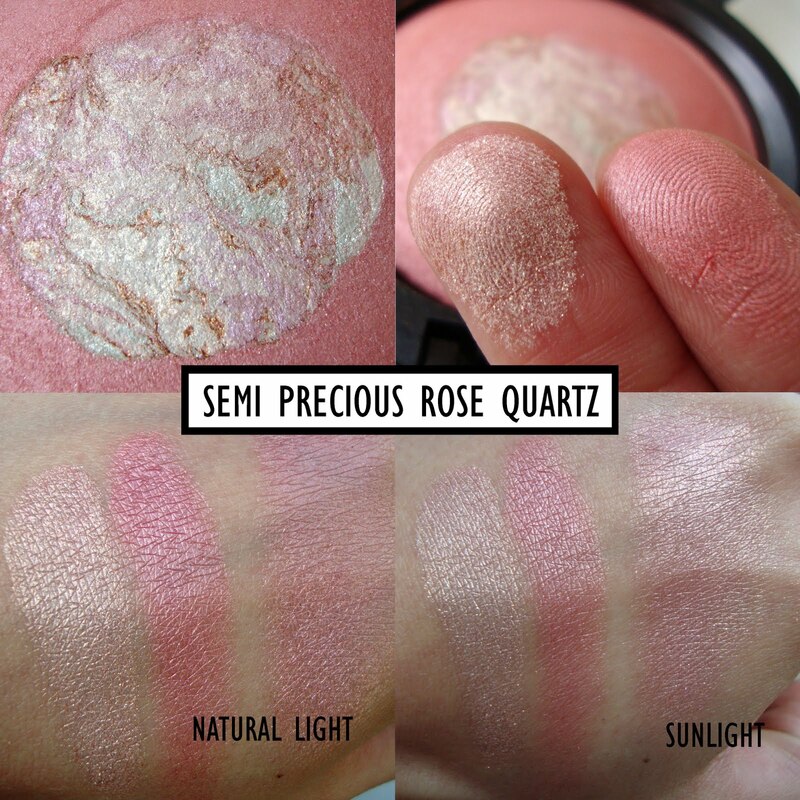 rose quartz is so pretty and i love that golden shadow too! i haven't been to the MAC counter to check these out yet but im definitely going this weekend! 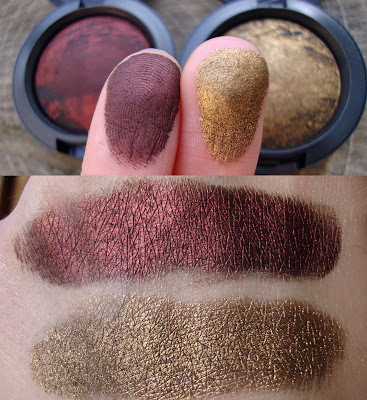 Agree that golden gaze is the best of the bunch....but the red is also so nice & intense! I think the collection is so original! Love the shades you got. The rose quartz looks very enticing though! The Mineralized Skin Finish looks so pretty! I agree with you on the brushes and lip things... nothing special! Looove the red eyeshadow. Both eyeshadows are gorgeous. I haven't purchased any Mac in a long time. Well besides my foundation. I totally missed out on all the collections, but this one catches my eye mainly because I love mineralize blushes I wish they had more of a variety though. I want to place my order but I think I'll wait to see some of the blushes in person. I like that MSF a LOT!!! I got that and the eye brushes. I really like them because I can use the synthetic hair side for eye primers and the natural hair side for powder shadows. The brushes are pretty useful to me. In any case, great post! i got the baby fix+, too! and now rose quartz is on my list =). Oh Muhsine you're so horrible for showing me how gorgeous Rose Quartz is! I have Stereo Rose and I'm so glad you compared the two... Rose Quartz will be mine! Smoked ruby looks like cranberry. @Love Always, Me. - Smoked Ruby is much MUCH darker than cranberry and more black/brown. Hey there Muhsine! I'm soo thankful I came across your blog! I ♥ it soo much! And u're beautiful! Oooh, very pretty and very tempting! Smoked Ruby and Golden Gaze are stunning colours. I haven't looked at this collection at all but I'm tempted by both of those. Thanks for the swatches. Love the rose quartz the others I don't think I would waste my money. The remind me of accessorize make up collection. The may be some dopes there. Great clear swatches, thanx for that!